The golden moments in the stream of life rush past us and we see nothing but sand; the angels come to visit us, and we only know them when they are gone. May 2012 bring many golden moments. Being in the present moment enhances the stream and prevents experiences to pass you by without noticing the many angels that show up in your life. Enjoy your new year to its fullest. 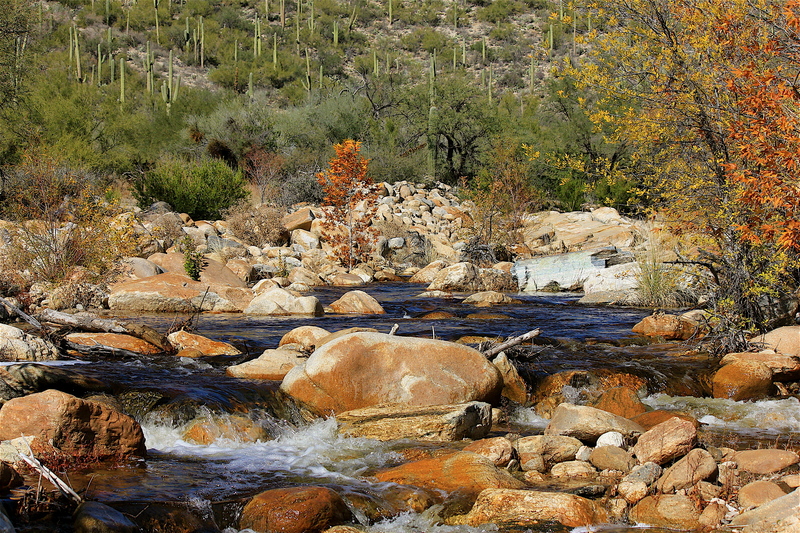 This entry was posted in Photography and tagged Arizona, nature, photography, quotes, Sabino Canyon. Bookmark the permalink. what a wonderful shot, I like it! The deep blue of the water and the autumn colors of the trees…. Fantastic!! Thanks Filipe, I appreciate your comment. I’m just learning photography by taking pictures and experimenting. Writing from Tucson, AZ or various parts of the country depending upon our travels. Enjoying the present moments of the prime years of my life. Hoping to share a little of my joy with others.